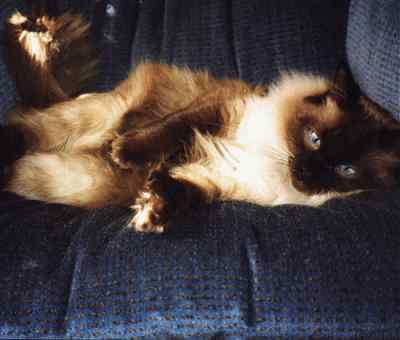 I am Mani the Zen Cat. I am a Zen Cat. My birthday is the 18th of November, and I was born in 1996. I have many many brothers. Visit them at the webpage I have made for them. I like many things. I especially like eating, sleeping, and playing. I love my huge feet. Very soon, I will have a site dedicated entirely to them. They are big, brown, and they even have extra toes!!!!!! Hotmail: I got my email address from them, and you can too! It's free!!! Please leave a message in my answering machine. Webrings: Go to all of the Webrings that I am in. 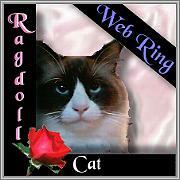 This Ragdoll Cat site is owned by Mani Purr. is owned by Mani Purr. 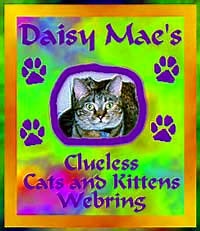 Want to join the Daisy Mae's Clueless Cats and Kittens?